latest New Yorker cover: ripoff of Powells Books? The October 19 cover of The New Yorker features a painting by Eric Drooker, titled “In the World of Books”. It’s very similar to the image used on the below sticker for Powells Books, in Portland, OR. Actually, Powells has been producing posters and other goods with this theme for some years, in keeping with its slogan, “City of Books”. So, did a) Eric Drooker lift the graphic idea from Powells? Or, perhaps b) the idea is obvious enough to be independently arrived at, or c) there is some common source. Or, perhaps d) Drooker did the posters/stickers for Powells. I can at least say for b) that I haven’t seen it anywhere else, in years of looking at book and bookstore materials. For d) I note that Drucker’s and the sticker’s painting styles are very different. c) common source: can anyone suggest? In any case, I think the difference in emphasis, between “City of Books” and “World of Books” is interesting. The “world” of books, in Drooker’s view, contains nothing but books; in Powells’ view, by contrast, books are a large presence, equivalent to the skyscrapers of a city, but they are set amid a real environment: trees, streetlamps, a Portland streetcar going by (like the one that goes past Powells’ main store), and a mountain backdrop (Mt. Hood, Oregon). 1932 RCA Victor radio, designed to look like a row of books with bookends. Nice example of a new technology imitating an older one — like early radio and television imitating theater. What I wonder is, did the makers or the buyers of this radio expect it would deceive anyone? After all, you don’t have to see it very closely to realize it’s a radio. Unless, perhaps, you had never seen a portable radio set. I think the concept was that some portion of buyers would want a radio that would blend in to their parlor, with its books. Or perhaps a book-less parlor would be dignified by these false books. Why are Bibles so unreadable, to perhaps a majority of people? Possibly it is partly due to the fact that most Bibles contain an relatively huge amount of content, much higher page density, smaller type, and unfamiliar paragraph and page layout, compared to virtually any other contemporary book. 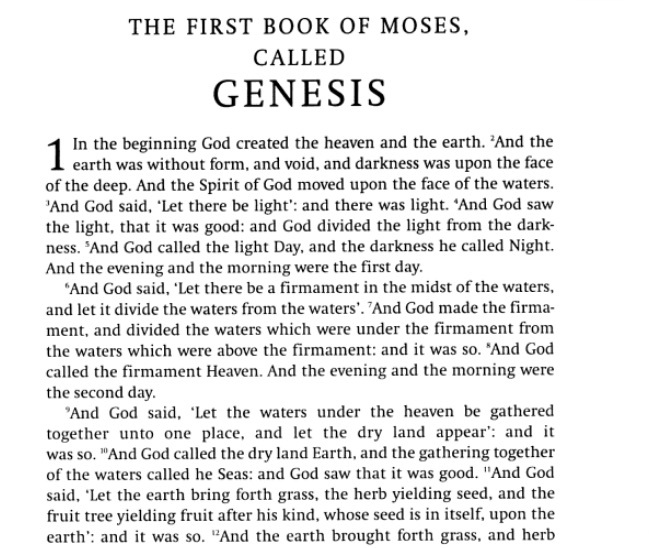 I hesitate to second-guess the large and sophisticated Bible-publishing industry; but as a designer, I have to at least wonder, if Bible readership is the goal, why are readers usually being offered such unwieldy and illegible volumes to read from? So this suggests an experiment. The design issues above mostly result from trying to force the entire Bible into a single, portable volume. But why the determination to do this? After all, most educated people know that what we call “the Bible” is a compendium of different writings from different times and contexts. Nonetheless, when it comes to Bible publishing, there seems to be an overwhelming preference, or call it compulsion, or perhaps economic logic, to pack it all into one volume. Thus the Bible edition — familiar to many of us from Gideon’s Bibles in hotel rooms, or the family bookshelf, etc. — with usually King James Version text, printed 2 columns per page, with each new sentence or “verse” numbered and starting on a new line. lineation: are sentences gathered into paragraph, or each one given a new line? number of volumes: one or multiple. In many years of looking for Bible editions in bookstores used and new, I’ve found that paragraph and single-column layouts are unusual, and multi-volume complete Bibles are quite rare (correct me on that, bibliophiles, if need be!). More to the point, I’ve simply never found the reading Bible that I want: a King James Version, paragraph single-column format, in a edition of 4-6 volumes, with readable type size and no show-through on the paper. 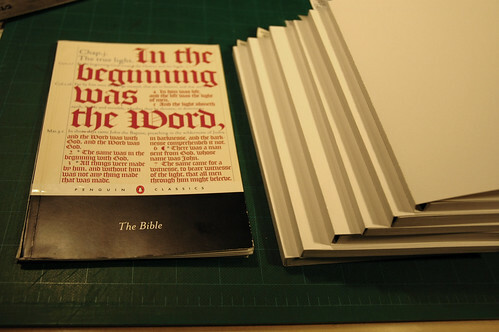 Historical note: Bible design exerts a fascination over many book designers, quite independent of any religious or even literary interest in the text. That is because the Bible is widely considered to be the ultimate challenge in book design — and a challenge with centuries of fascinating history behind it. 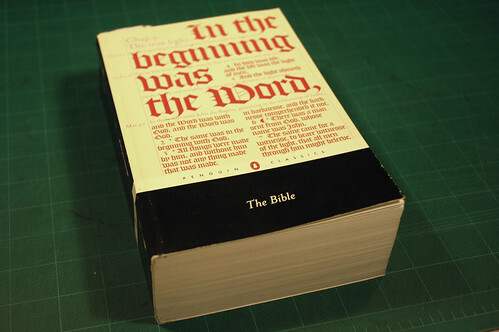 It’s something like the Ur-text of book design: still, the most widely printed book in the world, every year for centuries. Ok, so, I started with Penguin’s paperback edition of the The New Cambridge Paragraph Bible (2005, edited by David Norton), below. This edition traces its lineage to the landmark 1873 Cambridge Paragraph Bible, edited by F. H. A. Scrivener. (see this good BibleDesignBlog post about CPB and other full-paragraph Bible editions). Like the 1873 edition, it is a King James Version text, printed one column per page, and with prose sentences gathered into paragraphs (rather than each on a new, numbered line). These two reforms bring the presentation much closer to 19th / 20th Century book-design norm. Then, I literally cut the book into sections, cutting through the spine with an X-acto knife. This produced separate book segments for front matter, back matter, and six other sections. Then I applied new wrappers (i.e. 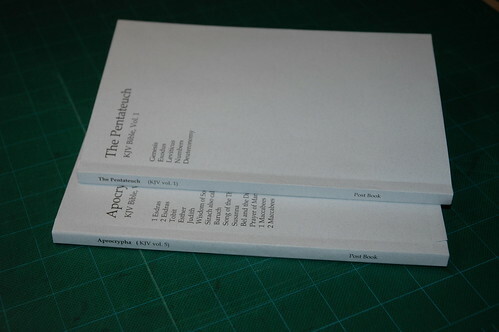 wraparound paper covers) made of 120-lb cardstock, which I pre-scored to produce flat spines of appropriate width. The front matter and back matter, I recombined into one booklet. The end result: a King James Version Bible, in readable, paragraph, single-column layout; divided into six easy-to-handle paperbacks. At last, a Bible edition that feels much like a contemporary paperback novel (or set of novels). I happen to think there is an untapped market for an edition like this, for people like me; but again, it’s hard to believe that Zondervan and other other big Bible publishers have not already considered it carefully. If not, have your people call my people. I’ll be enjoying my beautifully readable edition. 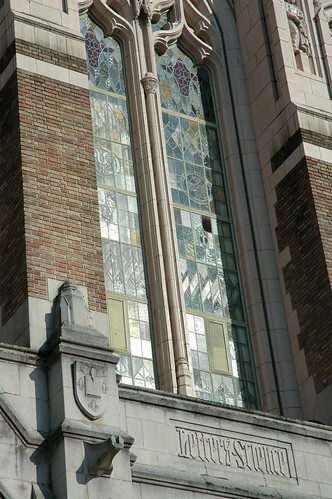 The rich iconography in the facade of University of Washington’s main Suzzallo Library has been well-noted by commentators. For example, in the Wikipedia entry for the library, or in the architecture guide by Norman J. Johnston published in Princeton Architectural Press’ “Campus Guides” series. The guides I’ve seen all mention the 24 sculptures of famous cultural figures, set on the outside faces of the building’s buttresses. Several also note the three figures set over the main entrance, by the same sculptor as the buttress figures, representing Thought, Inspiration, and Mastery. However, the 24 figures are far up, hardly visible from the ground; and the three big figures are not visibly labeled (that may be why Johnston gets them mixed up in his commentary). 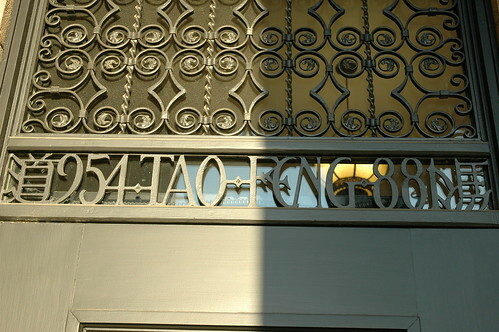 Strangely, I can’t find mention of the inscriptions which are easily the most visible to any person actually entering the library: the brasswork directly over the six doors, representing six famous figures in printing and publishing: Tao Feng, Gutenberg, Caxton, Aldus, Estienne, and Elsevier. If this brasswork is as old as the building (1926), it’s actually quite remarkable that the Chinese “father of printing” was given the first place in this pantheon. It’s strange, however, that the screen presents his years as “954-881″, i.e. B.C., about 1900 years earlier than the real Tao Feng (aka Feng Dao), whose years are the reverse, 881-954. The Chinese are ancient, yes, but not always that ancient. (and once again, I feel like I’m the only guy who ever studies these plaques). Above the fourth door, centermost of the “in” doors, the inscription reads “Aldus”, for the famous Venetian printing and publisher Aldus Manutius. I wonder if this placement had any part in the naming of Seattle-based Aldus Corporation, whose creation of Pagemaker software started the “desktop publishing” revolution. Speculation aside, I think the position of these six printer/publisher names, directly above the doors, is poetically apt. Further above is Thought, and Inspiration; and far above that, the pantheon of Moses, Dante, Adam Smith, etc. ; but usually the main pathway to Learning is by books and printing, represented by these printing/publishing figures which make up almost literally part of the door into the library. Intentional or not, the positioning of this group expresses a fundamental truth about learning. more photographs of Suzzallo library.